The Cellpod, a Tripod for you Cell | OhGizmo! By David Ponce on 07/25/05 • Leave a comment! It’s really darn hard to take a group picture with your cell. At least, it is if you want to be in it too, and don’t feel like asking a passerby to take it for you. That’s why the Cellpod from Joy Innovations is such a great idea. 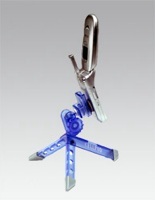 Cellpod is a quick-attach, quick release tripod for your cell phone camera. Cellpod is a product that is small enough to carry with you all the time. It fits easily in a pocket, purse or backpack. Cellpod easily connects with the popular “belt-clips??? that are in use today. That standard button that hooks the phone to your belt snaps directly into the Cellpod. Many of the leather cases that people purchase to cover their phones have these “buttons??? built in. It takes just a few seconds to attach. When you are done there is a quick release. If you don’t use a case or belt clip, an attachable button comes in the box to allow it to work with Cellpod. For $25, this 2 ounce accessory should be rather indispensable. Get it here and thank me later. Story VIA BoingBoing.